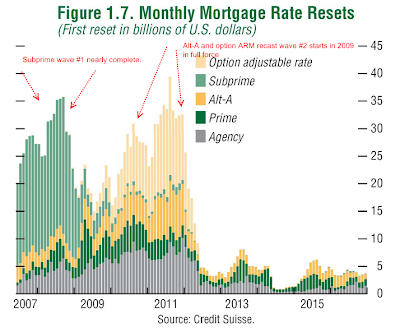 While the US has "successfully" withstood the first wave of subprime mortgage resets through the end of 2008, another round of rate resets is on the horizon. We are currently in a lull in resets but by the end of 2009 the mortgage market will see two years with massive numbers of resets totaling hundreds of billions of dollars. As interest rates have started to rise and futures markets are pricing in a federal funds target rate increase by year-end, these reset rates may be considerably higher than they would be if done today. These resets alone will significantly drain the pockets of an already overspent consumer further curtailing his ability to spend and keep the economy chugging along. The effects of this drain cannot be underestimated. The headwinds facing the US economy in the mortgage market give credence to the argument that the US is likely to have very slow to negligible growth for several years. The days of consistent, 3-5% annual growth are likely behind us for some time. The deleveraging of the American consumer will inevitably slow an economy 70% dependent on its consumer spending.